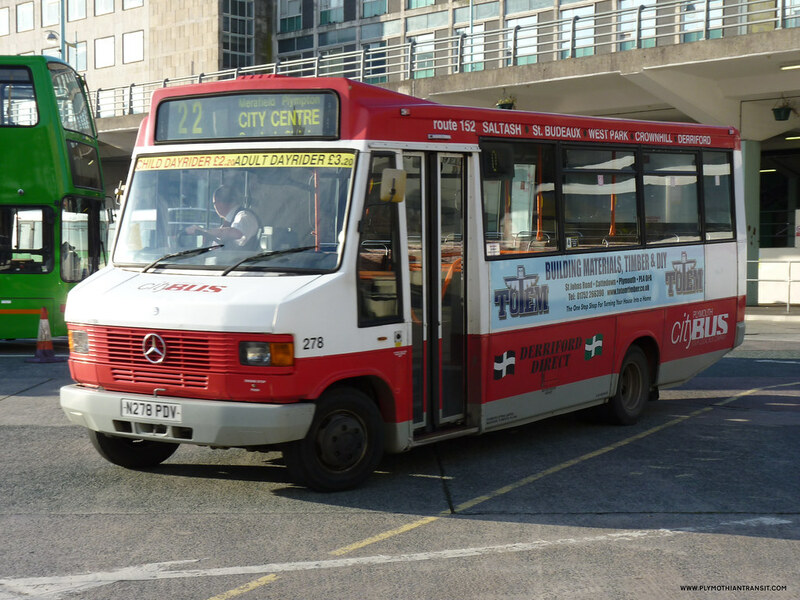 Plymouth Citybus havent really been big fans of route branding, or at least they aren't yet - who knows what the continued Go-Aheadisation of Citybus will bring? The 34 is probably the only major route which has received route branding with the three Enviros still vinyled up, although it wont be for much longer as they are due for repaint and will receive standard livery in due course. This was more down to the request of the South West Regional Development Agency who provided funding for the route. The previous example of Citybus route branding was this half hearted attempt for use on the 152. I haven't actually seen it on the 152 itself for ages but as far as I know it carried this 'livery' up till the end. I am not sure when it received this lettering. My earliest photo I can find at the moment is from April 2006 so it was before that. The latest photo I have of this bus in service was May 2010 on the 59. Well its no longer with Citybus as the PTOTPA blog explains. This bus has now been fully repainted and looks extremely smart as part of the Devonian fleet. To see the bus I recommend you visit the PTOTPA blog on the link below. I hope that the Enviros will be painted in the new livery complete with new logo because if they repaint in the current livery then they are wasting money! Rob - I havent seen any proper repaints from Citybus for a while now so I guess they are on hold until the new livery is launched. I am pretty sure we will see something fresh pout of the paintshops this side of Christmas. Unlikely with all of the recently won refurb work for Group.